Where do I begin? Saturday had a great afternoon with David and his family, and he took me to Boston Logan at 4PM. Easy check-in and boarding, pleasant flight to Dublin, and I caught a few hours sleep on the plane before arriving at 5:30 AM. One thing I worried about was making sure I could get Euros from an ATM, I had all bases covered (ATM card, Pin number for credit card, etc) only thing I did not count on was a storm that knocked out all the ATM systems in Dublin the night before. Well again to solve all I did borrow 50 Euros from David (he carries many different currencies at all times), and eventually I found a working ATM in a little village. Car check in was also very easy, and I have a lovely 5 speed Diesel Renault. Instead of driving straight to Cashel, the other night I decided to drive to the 6th century Glendalough Monastic site passing first Powerscourt Gardens (not open at 8 AM) and then over the Wicklow Mountains. I then followed back roads (once you leave the few motorways they are all back roads) eventually arriving in Kilkenny where I had lunch and toured the castle. When a 12th century castle is owned by one family as a residence for 500 years it gets modernized at various time periods, so viewing this was interesting, and some of the 19th century “upgrades” are still extant. Finishing up there I found the back road to Cashel that took me past the Famine Warhouse which was the site of a rebellion in 1848. I want to learn as much as I can about the Famine, and the resulting deaths and migrations that lasted over 100 years – you may find it interesting. 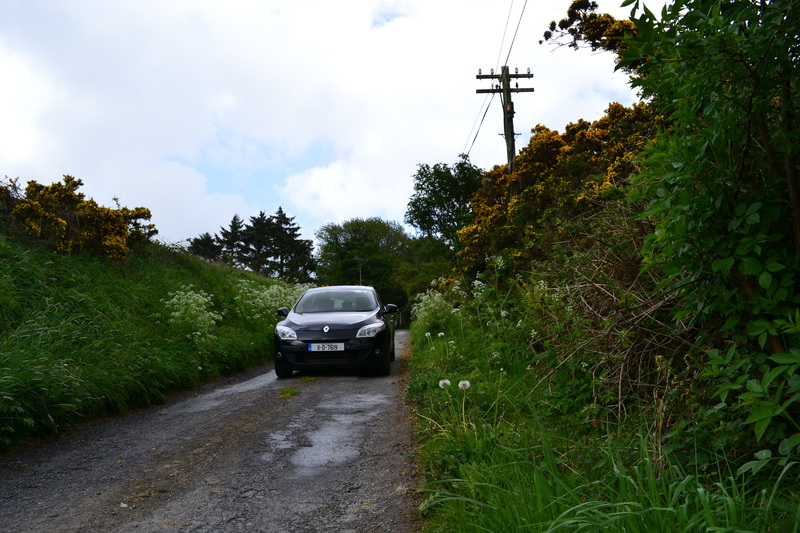 Another intriguing thing I can’t get over (note picture above) is that the roads (even through fields) cannot be straight – have only room for 1 3/4 cars at best – and have hedgerows either natural, below grade, or formidable stone walls – towering blocking views, and leaving no place to go. Something I have to learn about. In my reading at dinner (in a small pub in an ancient hotel) I found a way off the path walled medieval town I want to visit tomorrow. Kilkenny was a walled town, but too big for me to enjoy (remember I connect to Walpole more than a big city like Keene – ha ha). I am afraid if I ramble along too much that you may not come back and read again, so I will sign off for now and upload and label a few images in a slide show below. Thanks for visiting with me. This entry was posted in 2011-a - Ireland - (May). Bookmark the permalink. I’ve been to Kilkenny Castle! Kilkenny is a great town – though, as you say, it’s bit larger and a bit more populous than Walpole. I’ve driven for miles and miles to find an ATM in the west of Ireland. They’re not nearly as ubiquitous as they are in the States, at least not in the more rural areas of the country. Anxious to hear about Saratoga Springs. See you soon, alibiet with greenbacks in hand. Wow Ray, it is absolutely green and lush. Note the rain, eh? Do not know what the yellow flowers are but they are beautiful. All I have is snow laying in areas other than the roads. Had a little sleet and slush storm this afternoon. Almost 7pm and still daylight. Will be until after 10pm now. Keep enjoying that trip and so glad the flight was good. Be careful and take care of yourself. Actually it was still light here at 9PM, but no snow like you have in Alaska. Someday I will visit. Stay in touch!! The photos are beautiful; now I want to visit Ireland even more than I did before! The foliage looks a little different, but I think the yellow flowers may be a species of Scotch Broom. I don’t know the latin name, but I’ve seen them in soft, butter yellow (my favorite), a brighter yellow like those, and also purple. There’s one in our yard just coming into bud. I’m enjoying your posts so far Ray, looks like you are doing just fine with the software. Keep them coming! Also, enjoy driving that diesel Renault – I had one in France, Switzerland and Italy and loved it. The faster you drove the better mileage it got – oh yes, right up until I got that speeding ticket in France which had to be paid on the spot. Have fun my friend.